Having trouble with eating too many carbohydrates like bread, pasta and cereal? Finding a way to cut down on your carbs is a great step to keep on track. Try this carb management strategy to limit your carb intake and help with your weight loss journey! This strategy entails eating most of your carbs in the evening. This may seem counterintuitive to some, as we have often been told to eat carbs in the early part of the day (front-loading) and not eat at any carbs in the late afternoon and evening, or it will all get turned into fat while we sleep. However, this is another classic nutrition myth that has no real basis in science. Eating all of your carbs at night can actually help with your fitness goals. By keeping carbs low throughout the day, you will help prevent any big sugar crashes that zap your energy and leave you craving more carbs! Carbs digest quickly in the body and often leave you craving more, whereas protein and healthy fats digest much more slowly and leave you feeling full for much longer. When you eat carbs, it also triggers the production of serotonin, your body’s feel-good hormone, which helps you to feel more satisfied and relaxed in the evening, so you can get a more deep and restful sleep. It’s easy – just stick to eating protein, healthy fats and fibrous vegetables throughout the day, and save all your carbs for one large evening meal. At night you can eat a large carbohydrate meal that will leave you feeling satisfied and satiated, so you can relax and get ready for bed without worrying about cravings. Just make sure to stick to healthy carbs, like sweet potatoes, rice and quinoa, and make sure to eat 2 to 3 hours before you go to sleep to give your body some time to digest! 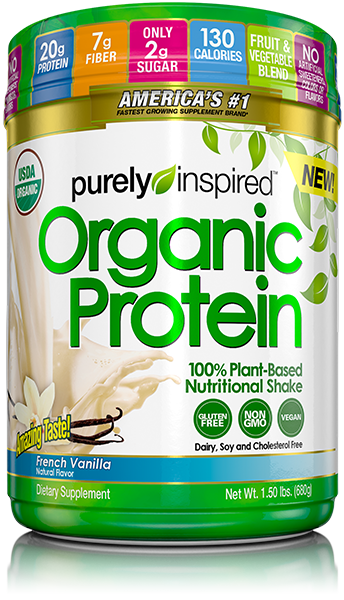 With 20g of plant-based protein, 7g of fiber and only 2g of fat per serving, these tasty shakes can help you get the nutrition you want in your diet without all the junk!